Roses are red ... blood red.... Lang hungers for power. He wants a Conduit and thinks he's found one in Crimson Daly. He hires mercenary vampire Rojo Rose to quietly bring her in. But when Rojo meets her, and she kisses him, bites his lip and shoves him away, Rojo realizes bringing her to Lang might be his most difficult assignment ever. She intrigues him more than anyone else ... until he finds out Lang wants to use her in the way Rojo fears the most. 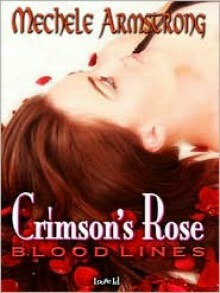 Crimson dreams of roses, blood and killing, not a good thing when the vampire you're in lust with's last name is Rose. They can't stay away from each other. Their passion explodes everyplace they go. Then Crimson is betrayed, and Rojo must face his darkest fear to become her Rose and save her life.